Here's your February market update, MLS numbers courtesy of the VREB via Marko Juras. These numbers are for the Victoria Real Estate Board's reporting area, including Sooke, Shawnigan Lake and the Gulf Islands. These numbers are not the official February totals, which should be released late morning March 1, 2011. UPDATE: I've updated the numbers below with the official data wherever possible. Prices won't be falling in February. Despite a significant drop in sales volume (25% or more), the lack of new listings volume doesn't put enough pressure on the marketplace for noticeable price drops, yet, though it's definitely building. Sales built consistently as the weeks of February went by. Especially in the entry level SFH category. This is in harmony with what we expected considering the coming mortgage rule changes. I expect this category of housing sales to be short lived into March. If this was the sales flurry that all the pundits predicted would be brought forward by the CMHC mortgage rule changes, then the bears have dodged a bullet. You can expect the usual suspects to be absolutely ecstatic in the media tomorrow, but the truth is these numbers have to be disappointing for everyone. Sales volume is down, but the listings volume is down too, almost one for one. That said, it's obvious from our weekly updates that sales volumes didn't meet expectations and the "mad rush" to get in before the 5% down 35 year amortization buyer crowd became priced out forever was short and underwhelming (but not over yet). Fimrite added that although February’s sales were below the sales totals for February of a year ago, the beginning of 2010 was marked by an unusually strong market that softened as the year progressed . Listings aren't jumping very fast for this time of year. I think it's safe to say potential sellers aren't showing a marked increase in confidence in the market right now. OMC in comments says we're experiencing normal new listings volumes for this time of year. When I use the 2010 experience as "normal" we're not, but when you dig back a few years, it's obvious we are. 4500 total active listings by the end of April is definitely within sight, and that's high volume. When looking at these numbers we need to realize that the number of dwellings and the number of people have grown exponentially in Victoria since then. Obviously the market in Victoria in the early 1990s was very hot, even when we compare it to the 2002-2007 period of craziness. It was actually more active, but those sales represent higher per-capita and per-dwelling sales activity than current numbers do. In other words, 488 sales in February 2011 is a substantial drop in market activity from 488ish sales in 1996. "If Canadians are so stretched financially and can barely afford their homes, why aren't mortgage arrears showing up higher than they are? After all mortgage arrears are still lower than they were in the early 1990s and our Canadian financial institutions are prudent." It's this kind of rhetoric that makes the real-estate-always-goes-up crowd breathe heavy on their finger nails before polishing them against their designer shirts in gleeful gloat mode because at this point, in their own minds, they've won the argument. "It doesn't matter what your data tells you, my data tells me this time it's different. And that's a fact." From 2006-2008, it was the 40 year amortization that allowed more over-extended Canadians to avoid falling behind. The government eliminated new origination's of 40 year mortgages in October 2008, but the banks found a way to allow the effects of them to continue: can't afford the increase in payments? Skip one. Every year. For as long as your term allows. In 2010, the mortgage market was tightened ever so slightly by requiring CMHC-insured mortgages to be qualified at the discounted five year rate. You qualify for slightly less money, but you still have the flexibility of the 35 year amortization at the discounted variable rate to over-extend yourself into real estate financial Armageddon. The "prudent" banks are only too happy to oblige you because your mortgage is insured by the CMHC and they're turning around and selling these loans into the mortgage backed securities market faster than they're writing them anyway. In other words, the banks have zero risk in this game. In 2011, just 20 short days away from today, the CMHC will stop insuring 35 year amortized loans. The banks have already found their solution to this little issue, it's been working for them for a few years now: let Canadians skip a payment and roll the interest back into the principle. It's a little accounting trick that nets the debt holder more money as long as the mortgage doesn't default--Sh&t it's as close to a win-win-win as the Canadian mortgage game can generate: debtors don't have to pay their debts on time, banks don't have to default on the loans and the pension funds that eat up the MBSs being sold by the CMHC don't see any risk to their investments as long as the tax payers keep backstopping this prudent smoke and mirrors financial practice. The more I become aware of what the banks do, precisely because there are few economic consequences to them thanks to Mr and Mrs Canadian taxpayer, the more I believe there is only one solution to this problem: privatize the CMHC. Prudent Canadian financial institutions my a$$. There's something like 1300ish REALTORS® in Victoria. Less than 1% of them are advertising "commission sharing" online, some are offering other discounts to get clients, and then there's a bunch of 'em (who make up a small percentage of the total) who wake up in the morning and climb out from under their cash-stuffed silk duvets. So we won't assume that 5% of the two billion seven hundred ninety four million one hundred twenty two thousand one hundred and eighty one dollars went to REALTORS®. I'm in a giving mood. Let's be generous to the industry today and guesstimate that the total commissions collected added up to just 2.5% of total sales volume (I wouldn't be surprised if it was closer to 3% in fact). That means there was very likely $83,823,665.43 in commissions for the region's 1300 collectors to divvy up for an average $64,479.74 pre-tax, pre-expenses income. The industry is an expensive one to participate in: you've got heavy desk fees at the big-boy brokerages, Lexus leases, Gucci watches, Armani suits, Jimmy Choo shoes and Luis Vuitton leather listing binders to pay for if you want to project success. I'd be surprised if the average REALTOR® didn't spend half that $65,000ish on expenses related to securing their real estate riches dreams. Makes you wonder why anyone would spend the $10,000+ to study up, buy insurance and have a 6-month expenses float to break into the business doesn't it? (Probably why a great many would-be agent goes into it part-time). Real estate trading services is, despite the fact the industry has been colluding on commissions charging what the market will bear, a very competitive business. It's a dog eat dog world out there and we all know there's some big dogs in this little town. The VREB showers recognition on the big dogs each year and sales managers in the brokerages try to motivate as many of their little dogs into the big dog pit as possible. You've seen the recognition program, the MLS® Gold, Silver and Bronze Awards, I'm sure. Every agent ever to win one is sure to plaster it across their cross-armed-leaning-up-against-the-wall-coolly, hipster vinyl photo on the back of the #14 bus to remind you they're far superior to their peers--"Use me, more people do!" These numbers were calculated assuming standard commission rates of 6% on first $100,000 and 3% on > $100,000. The majority of the deals aren't double ended, and sales revenue is credited based on commission-able earnings meaning if the average home sells for $600,000 generating $21,000 in commission split equally ($10,500) then each REALTOR® is credited with $300,000 in sales revenue towards the MLS® Awards. A REALTOR® has to get in on about 9.5 average-priced SFH deals per year to be a bronze winner. I'm going to stop there because the deals done are too diverse to make an even remotely accurate average assessment of deal volume. But I'll leave you with this thought: It's highly likely the taxable income of a bronze winner is somewhere between 60% and 70% of the estimated commissions collected. This means that its likely the top 30% of Victoria's REALTORS® get in on enough deals to earn what I calculated as the "average" above. There's an old adage in the sales world: 20% of the players take home 80% of the cake. It appears this may be true in the local real estate market. It's snowing Victoria, in February, after Ground Hog Day, when the daffodils are just set to bloom. Twitter is all abuzz with the #YYJ #Snowpocalypse. And Cameron Muir "forecasts" home sales will rise in Victoria this year by 7% over 2010 sales volumes. What a leap of logic that is! Harder to get a mortgage? For some folks this is true. More accurately though is the mortgage you can get in March will be more expensive than the one you can get today (although I'm hearing that some banks aren't doing 35 year amortizations on new approvals already, just honouring pre-approvals at 35 year ams). Interest rates a-rising? Most certainly they're trending that way, albeit only slightly right now. Sales volumes a-slumping already? Most definitely: January sales volume was down 19% YOY and February looks like it'll be down anywhere from 20% to 30% YOY. Remember sales were supposed to be pulled forward into the first two months of this year because of mortgage rule changes. If they're not jumping now, how does anyone see them jumping later? I bet you dollars to donuts the local rag gives old Cameron a free pass on his economic forecast wishful thinking. UPDATE (Bet won, H/T to LeoS for link, please don't click it, you'll regret visiting that dirty rag). It must be nice to live in a world where you can make sh&t up and never get called on it by the folks whose job is to weed through the bullsh$t (I'm looking at you news media). Prediction: Cameron Muir and the BCREA will revise their forecast in April, down, and the media will give them another pass. I've often thought that townhouses have the potential to be Victoria's perfect property for a fair number of people. As time goes on, I'd think more people would be attracted to townhome living. No shared hallways, very little yard work, affordable "full size" homes without the need to suite your house out, certainly these are a few advantages for busy working couples/families and early retirees? The trouble with Victoria townhomes, especially at the entry level price point, is they're typically old, typically on busy streets or near busy highways, typically have high maintenance/strata fees and typically have restrictive strata councils that make them less appealing than buying an entry-level duplex or house with a suite. Oh, and they're almost always extremely overpriced--I'd say more so than any other product on the market today. I checked out a couple of open houses the other weekend. The house had a 1 bedroom suite in it, and a smallish 3 bedroom 1 bathroom main living area for the owner to occupy. It will likely fetch around $450,000 when it sells, assuming no structural or significant cosmetic work is necessary (I didn't see evidence of either). I also looked at a townhouse listed for close to $350,000. Both neighbourhoods were comparable, but the townhouse actually had the location advantage. Let me do a little first time buyer comparison here: assuming a 5% down, 30 year amortization mortgage at 3.49% for a 5 year term. Currently, townhouse owners, and the few people buying them at the entry level, believe you should pay a premium to own a place with no direct claim to land and little ability to influence financial decisions directly affecting your monthly budget (for example, increases in maintenance fees, special assessments for parking lots, siding, roofs etc). It's no wonder then why those townhouse owners trying to sell are having an especially hard time right now. SE MOI is about 7, Sidney MOI is about 3.5 and CS MOI is about 3. Langford and Colwood combined had 2 sales, with almost 80 properties on the market right now, they're showing a bare-mountainous MOI of 40. And they're still building out there! It's a strange market for sure, these Victoria town homes. I desperately want you available listings to be more appealing, but your insane asking prices relative to your demand and your entry level duplex and SFH competition I just can't get past. Lucky for you, all you have to do to make yourself more appealing is recognize that dropping your asking price by 20% or more will bring the buyers shopping for condos and entry level single family homes straight into your empty open houses. This is panic buying month. The news media tells us so (Times Colonist link warning). With mortgage rule changes less than 30 days away, those buyers desperate to use the 35 year amortization should be out snatching up properties as if they're not making any more land. Coupled with creeping interest rate rises, you'd think the feeding frenzy on homes in the provincial capital would be incredible right now. But it's not. In fact, it's far from a feeding frenzy out there. It's down right eery how quiet the local market is. Here's your Monday market update, MLS numbers courtesy of the VREB via Marko Juras. These numbers are for the Victoria Real Estate Board's reporting area, including Sooke, Shawnigan Lake and the Gulf Islands. We've been averaging about 105 sales per week this month. If the trend continues, we'll hit 440 sales in February 2011. The last time we had February sales this low was near the bottom of the mini-crash in 2008/2009. We don't have the listings volumes and the sky-is-falling-consumer-sentiment now that we had then, so prices are much stickier and "the deals," if you can call any individual sales that right now, aren't nearly as good as they were. Keep in mind that everyone agrees the mortgage rule changes are pulling buyers forward, not scaring them away. If this turns out to be true, this foreshadows a dismal spring shaping into a potentially troubled year in the local Victoria real estate market. It would seem potential sellers agree with this outlook: they're not listing their homes at a normal rate. That said, no one should claim current inventory of over 3500 available units for sale is anything other than untypically high volume, perhaps 20% higher than what was the February normal for much of the past decade. Albertans move to the West Shore? Apparently they do. Case in point, "The Browns" who started asking some area-specific questions about Langford, Colwood and Metchosin. The boxes are rough approximations of the three municipalities in the West Shore. I know the Westhills development has a 20 year plan to put more people into tighter spaces than Victoria has ever seen, all the while calling those spaces "single family homes." They'll soon overwhelm that blue box. The red box is a mix of old and new. For the most part, that east end of the west shore is the most "affordable," if you call paying $450,000 for an 1800 square foot BC box built in the 1970s and likely painted once between then and now affordable. The new housing units in this area are nice, no question. But I do question the quality of anything built in the last 5-7 years in the Victoria area. I've heard too many horror stories not to question. I can't say anything bad about Metchosin. If I didn't have to do anything other than get up and work my land, this would be the place I'd do it in Victoria. Back when I was a teenager, we used to have the occasional friend who'd start dating a Metchosin girl. We'd call voyages to pick her up on Friday nights "road trips" and they almost always included a stop for gas at least once. Of course, back then, there weren't such things as "highway overpasses" and "expressways" to "speed up" the traffic flow. Nope, the trip took 45 minutes round trip, not each way like it does these days. At least the cars are more efficient nowadays. All kidding aside, we city folk like to poke fun at Langfordians. We have to, we pay way more to live. Or do we? Let's look at the numbers for West Shore single family homes shall we? 1 sold for under $350,000, talk about a value! As far as neighbourhoods go, I'll admit bias. I grew up on the other side of Victoria and have been taught to avoid Westshore living and it's inherent commute to get anywhere lifestyle. Every time we visit Costco, which I'll admit is getting less and less because of the traffic volume, I question why so many people choose to live in an area that hasn't had too many non-strata homes built in the last decade. I'd wager few "choose" to move from the east side of town to the west. I'll bet household finances dictate the move for locals heading west. And I'll bet that a good portion of people coming from away buy homes in the Westshore because it reminds them of what they're used to back home. If you've lived in Edmonton or Calgary, outside of the core, you'll feel right at home in Langford, with it's box stores, chain restaurants and houses built with five feet between them. But you'll soon come to loathe the drive into town, wondering why the heck there's traffic lights in the middle of what feels like the Crowfoot or the Whitemud. Yes, it really is like that. Saanich East sales amounted to 20% of the total VREB dollar volume transactions, 9% more than the next highest area, Victoria. Occasionally I get e-mails from readers. I got one not too long ago from a couple who had come across the blog in their house hunt. Its contents highlighted a big issue I've had for a long time in the way we calculate price to rent ratios in our market. I understand, without question, the need to compare apples to apples when we use this fundamental metric to track the market. The trouble I have with it though is rarely does it apply in actual purchasing circumstance. HHV, long-time readers, never posted, but felt the need to share our buying experience with you anyway. If you decide to write about us, please keep our names out of the post. Done. I'll call these fine young folks Mike and Molly. We bought a home. We didn't buy it reluctantly, we're really happy now that we've moved in and we've spent our first Christmas in our own place. But we didn't buy a home lightly, we did a lot of research and we looked at a lot of places before we bought. We know we made the right decision for us. When we started looking we quickly recognized there was going to be a considerable change in our lifestyle. I'm (Mike) a journeyman mechanic and my soon-to-be wife (Molly) is an office assistant in a doctor's office. Together we earn about $65,000 a year. Our families are both on the island and our jobs are here in the city. It's a priority for us to live close to work. When we went to the bank last spring, we were both shocked to find out how much money they were willing to give us. We didn't have a lot of debt, Molly had about $4,000 left on her student loan, we had $2500 on a credit card from a Mexico trip we took the previous winter and we have a $350 per month truck payment with about three years left before it's paid for. Our last place we rented was a 3 bedroom home, just the main floor, near the Gorge, for $1250 per month plus utilities of about $150. The bank offered us nearly $350,000. We had just a little over $15,000 in my RRSP I planned to use for the down payment. Molly had saved almost $5,000 in a TFSA for the closing costs. So we started shopping. And it was stressful. We quickly learned we weren't going to be living in a house any longer. We tried to find a townhouse, but the only places we liked close to our budget were in neighbourhoods we didn't, out in Langford or Colwood, far away from where we work. We wanted to remain a one vehicle household, so we needed to be an easy bus ride to Molly's office or, better yet, within walking distance. So we started looking at condos. We never saw ourselves living in a condo. Quite the opposite really, I hated the idea at first. But after living in rental suites while I was working on my apprenticeship and while Molly went back to school to do her certificate, we were getting really tired of living in places that weren't ours. Our parents were encouraging us, our friends were all buying or had already bought, my boss at work was even trying to convince me to take the plunge. We didn't like that all we can realistically afford is a condo, but that's the way it is here in Victoria and we're not willing to gamble on the market changing anytime soon. We went from a house to a condo, but because it's ours, we're OK with it. We were OK paying about $1400 a month for our rental home. When the banker showed us how the payments would work on the $350,000 they were willing to give us we decided to spend less. We weren't comfortable with $1700 or $1800 a month by the time we included property taxes and strata fees. So we set a budget of $250,000 to $275,000 to keep the total payments at $1400. See what I mean? While we are here, doing the math on apples, the Mike's and Molly's of Victoria are out there comparing apples to oranges and coming up with the same amount. They know they're not getting the same thing in the end, but that's not what's driving their buying decisions. They can "afford" to buy a home and keep their payments in a range they might be comfortable with today, but they're doing it at the expense of their lifestyles. Some of them may be happy in the long run, others may regret the decisions that led to the changes. But it presents a real issue that makes price to rent comparisons problematic: we isolate apples, compare them with apples, discover apples are X-factor overpriced compared to what someone willing to rent said apples will give us each month versus total cost of apple ownership -- all the while Mike and Molly are out there saying we don't want to rent an apple when we can buy an orange. That piece of baloney press release that led to an even bigger festering pile of poorly researched and written advertorial in the local rag yesterday got me thinking. I'm over calling out the crappy local written journalism, so that's not what I was thinking about, but I was thinking "do people really want to buy condos in such volumes that there are actually bidding wars right now?" The answer is no. ReMax took the one manufactured bidding war caused by underpricing a home to the market (assumed) and held it up as evidence that people are tripping over themselves to buy affordable Victoria condos. And the media didn't even bother to cast a shadow of doubt on their number one source of advertising revenue (assumed). At the end of January 2011, there were 808 condos listed on the VREB, an increase of 13% from the 715 listed last year. 90 units sold in January 2011. That's almost 9 months of inventory. Hardly a "seller's market" that produces bidding wars. Coincidentally, that volume of sales is off 20% from a year ago too. It's true that average prices rose slightly year over year, 3% to be exact. But to get a sale, sellers had to wait 68 days, 20 more than they did a year ago. Almost 69% of all condominiums sold in the VREB area last month sold for under $325,000, roughly the average reported selling price of all condominiums. There's roughly 200 active listings in the core priced under $325,000, about 40 sold, making this market segment fairly healthy at 5 months of inventory, some consider this balanced territory, but you'd be hard-pressed to find a credible analyst claiming these market conditions lead to anything other than flat, stable prices. When we look outside the core, only 6 condos sold for more than $325,000, there's over 250 available, making the MOI a staggering 41 - hardly the makings of a bidding war environment. The next biggest chunk of the pie are downtown condos priced between $325,000 and $400,000, making up a grand total of 9 sales out of about 72 active listings (8 MOI). 5 sold outside the core in that price range of the 130ish available, giving us another doozy of an MOI at 26. 15% of the condo sales volume last month we could reasonably call "luxury" market sales: 13 of them in total, 1 in Sidney, 1 in Esquimalt and 11 in Victoria/Vic West. 1 condo sold over $1 million dollars, in Sidney of all places. No wonder there was no real data in that press release or the subsequent "news article" (please read that slowly again with a Dr. Evil voice and use your fingers to make quotes in the air). If there was, we'd all recognize it for the steaming pile of dung it is. Monday market update: slow start to February? It's still early. But the first week of February has given us a glimpse at the state of the market for the first week of February. It's been almost two weeks since the CMHC mortgage amortization rule changes were announced. Are we seeing any sign of a rush to buy? It's still early to make any kind of assumptions, but given that the rule changes effect every mortgage on a property bought after March 18, 2011, the pressure to buy is high if you are wanting to use a 35 year amortization (why you would want to is a whole other discussion that typically ends with don't do it), we're not seeing the start of any kind of buying frenzy yet. 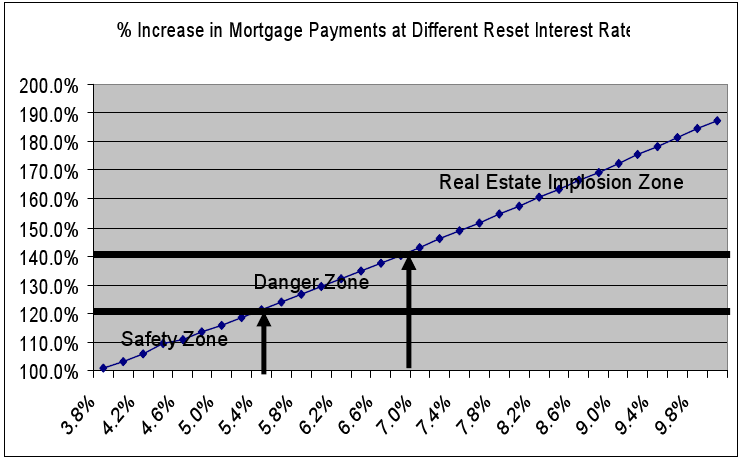 Rising interest rates, who knows how long or far these rates will go, may also add to any other mortgage pressures. There's four weeks in February. We've got numbers for the first week. And they're not looking stellar. Real estate is a 24/7 business, and as such, sales are rarely uniform, so it's highly unlikely the next 4 weeks play out like the first, but at this rate (extrapolated out to 312 total) we're going to be hard pressed to hit 400 sales. Victorians have drunk deep from the Kool-Aid though so I think we'll get close to that number. Which is a whopping 35% drop from last year. The G&M has an interesting piece today (Kabloona posted link in comments from previous post). Any move by the Bank of Canada could “easily” cause house prices to collapse, Capital Economics warns in a bleak report that suggests the Canadian housing market is likely to suffer the same sort of crash that has plagued countries such as the United States. As the bank raises interest rates, mortgages will become more expensive for Canadians. Add inflation to the mix, and Capital Economics predicts prices could fall 25 per cent over the next few years. Capital Economics also warns that a crash in prices could cost Canada Mortgage and Housing Corp., which insures high loan-to-value mortgages, to lose as much as $10-billion. To be fair and balanced, Capital Economics is in the business of selling market research, mainly stock market research. Are they trying to beat the real estate isn't the investment you think it is drum? Shoebetcha. Are they right? Time will tell. But their research aligns with plenty of other independent research calling into question the dubious claims being made by "economists" who's incomes are tied to the ongoing performance of real estate markets and real estate debt products. There's a commonly held fallacy in many people's minds these days: "if interest rates climb it means the economy is doing well and inflation is upon us; if inflation is upon us then our home's values are increasing despite rising interest rates, it's a can't lose scenario". If only it were so simple. And if only these true believers could point out one time in history where this held to be true for longer than a year. I invite you to read Reid's post from a while back where he shows you exactly what happens to mortgage payments in a rising interest rate environment. Canada is at a cross roads never before seen by her citizens: all time high real estate market values, all time high debt levels plus all time low interest rates. How anyone can point to history and say we've been down this path before and came out of it OK is far beyond "stretching the truth." The spin continues though: stable market, stable market, history, history, historical, blah, blah, blah. Fact is, January saw less sales than December, typically the slowest month on the calendar. Single family home prices bounced around like a cat on the 'nip too. It's a buyers market by any definition you want to use. Here's the breakdown, including a month over month comparison. The use of average price information can be useful in establishing trends when applied over a period of time, i.e. six months or longer. The Victoria Real Estate Board cautions that an average price does not indicate the actual value of any particular property. Those requiring specific information on property values should contact a REALTOR. If you're out there active in the buying pool, word to the wise, don't believe the industry spin and don't get caught with your pants around your ankles just because you can't fathom the idea of living another year paying someone else's mortgage. There is no fire. No need to run when you can crawl.